With its relaxed pace, array of beautiful temples, close proximity to many natural attractions, fabulous food and affordable accommodations, Chiang Rai is an ideal place to base yourself for a few days (or longer) if you have time to add the peaceful northern Thai city to your itinerary. If and when you go, here are ten things not to miss in and around Chiang Rai. Originally called Wat Pa Yia (Bamboo Forest Monastery), Wat Phra Kaew (Temple of the Emerald Buddha) is one of Chiang Rai’s oldest and most renowned Buddhist temples, and makes a worthwhile addition to your itinerary when you’re visiting the northern Thai city. Wat Phra Kaew is aptly named since it’s known as the original home of the emerald Buddha, discovered around 1434 after lightening struck the temple’s chedi (shrine) to reveal the Buddha within. The original emerald Buddha resides in the temple of the same name on the grounds of Bangkok’s Grand Palace and Wat Phra Kaew now houses an official replica of the Emerald Buddha made of green jade. 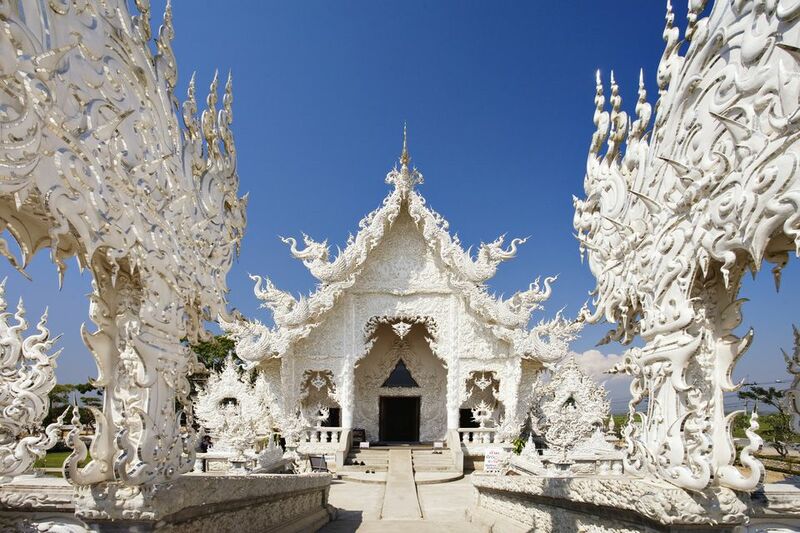 You can’t visit Chiang Rai without seeing the famous White Temple, located just outside the city. Designed by Thai visual artist Chalermchai Kositpipat, the massive all-white complex, covered in glass tiles, is one of the most unique temples in Northern Thailand and definitely the most surreal. The gleaming, 6.4-acre complex features an interior painted with murals filled with pop culture references, including Superman and Harry Potter. Construction began in 1997 and is still a work in progress. Get out your camera because there’s something eye-catching at every turn. Another unique complex in Chiang Rai is Baan Dam (or Black House), created by Chiang Rai-born artist Thawan Duchanee, who also resided on the complex until his death in 2014. Here you’ll find close to 40 buildings of various architectural styles housing many of Duchanee’s works of art, as well as found objects including animal bones, skins and skulls. Many (but not all) of the buildings are open to the public and spread out on well-manicured, peaceful grounds. Northern Thailand might not be the first place that comes to mind when you’re thinking about hitting the beach, but there is a relaxing stretch of sand you can visit in Chiang Rai. Located about two and a half miles outside of town along the banks of the Kok River, the beach is frequented by locals and makes for a refreshing place to cool off with a dip in the river. Before or after a swim, enjoy a traditional Thai meal and cold beer in one of the bamboo huts you’ll find around the beach. If you’re going to be spending any time in Northern Thailand, you’ll want to try a steaming bowl of khao soi, probably the most popular dish and the one most associated with the region. A creamy, rich and comforting coconut-based curry is served over soft egg noodles and topped with crisp egg noodles, which you can dress with the accompanying pickled greens, limes and chopped shallots. The dish might be a little different wherever you find it, but it’s always worth a try. Designed by Thai artist Chalermchai Kositpipat (the same artist responsible for the White Temple), Chiang Rai’s golden clock tower is an ornate and unique work of art in the centre of town that also serves as a traffic roundabout. While it’s well worth a look during the day, try and time your visit for 7, 8 or 9 p.m. when the elaborate tower gets lit up in a vibrant light show. The clock tower also makes for a good landmark for navigating the city due to its central location. On both Saturday and Sunday nights in Chiang Rai you have the chance to check out a Weekend Walking Street market. While both feature similar vendors, you’ll find that the Saturday market is slightly larger and the two set up in different areas of the city. Both start rolling around 5 p.m. and run until around 11 p.m. Sunday’s market is a little bit quieter, but at both you’ll find local Thai snacks, fresh juices and smoothies, handicrafts and souvenirs. Saturday walking street is found along Thanalai Road, about one block south of the clock tower and Sunday walking street sets up along Sang Khon Noi (also known as Happy Street). If you don’t get a chance to visit either Weekend Walking Street, or you want to browse another market, you can head to the Night Bazaar. The bustling stretch of stalls is similar to Chiang Mai’s Night Market but on a much smaller scale. You’ll find the usual array of souvenirs, Thai handicrafts, T-shirts and accessories. If you aren’t in the mood to buy, the Night Bazaar is a great place to fill up on cheap eats at the food court, in the form of fried snacks, pad Thai, hot pots, seafood and (if you’re feeling daring) an array of fried bugs. The Night Bazaar is also a good place to catch live music or a traditional Thai dance performance. Learn to make some of your favorite Thai dishes for yourself (and skip takeout) with a cooking class, of which there are a few to choose from in Chiang Rai. One good option is Suwannee Thai Cooking Class, with classes capped at eight students. Courses include a market tour, snacks, individual cooking stations and the chance to build your Thai cooking skills (and then enjoy what you make). See rescued elephants enjoying their natural habitat with a visit to Elephant Valley, an elephant sanctuary in Chiang Rai. Here there are no tricks and no riding—just an incredible chance to hang out with elephants who were formerly used for logging and riding. Choose from half and full day experiences to tour the sanctuary, feed the elephants, learn more about the work the sanctuary is doing and enjoy a Northern Thai lunch on the peaceful grounds.